1. What is your favorite word? Absolutely. 2. What is your least favorite word? Impossible. 3. What turns you on creatively, spiritually or emotionally? An intelligent conversation with someone. 4. What turns you off creatively, spiritually or emotionally? A negative person. 5. What sound or noise do you love? The sound of waves breaking in the ocean. 6. What sound or noise do you hate? The honking of a car horn. 7. What is your favorite curse word? As a Spanish speaking person, the four-letter word that ends with ..ño. 8. What profession other than your own would you like to attempt? Attempt? If I wasn’t an artist I would have love to be either a detective or a Forensic Crime Specialist. 9. What profession would you not like to do? Any profession that deals with retail and the public… I don’t have the patience for that. 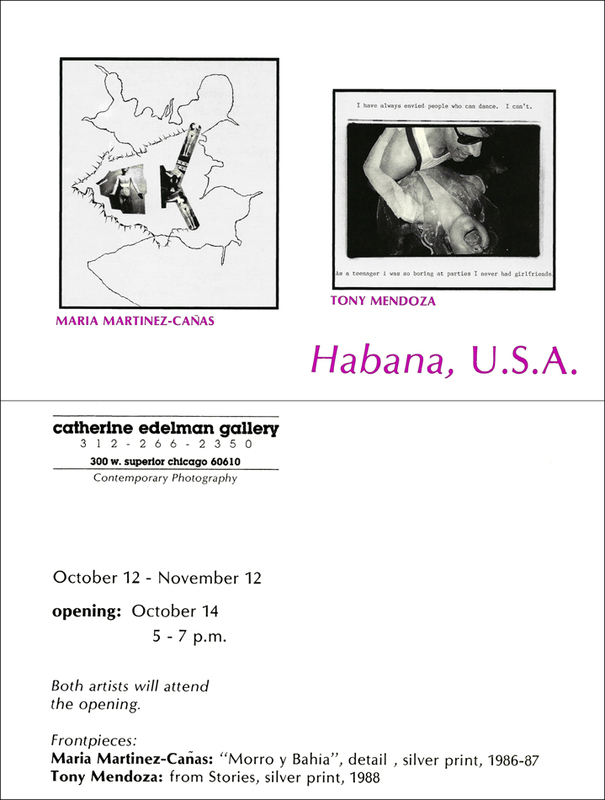 An announcement card from the first year of the gallery opened featuring the work of Maria Martinez-Canas, 1988. Click here to see more work by Maria. To see more of CEG’s announcement cards click here.